Galaxy of Adventures is supposed to be the gateway for young kids into the Star Wars universe. The short episodes feature more or less iconic scenes from the original movies, but in a highly stylized animated style. 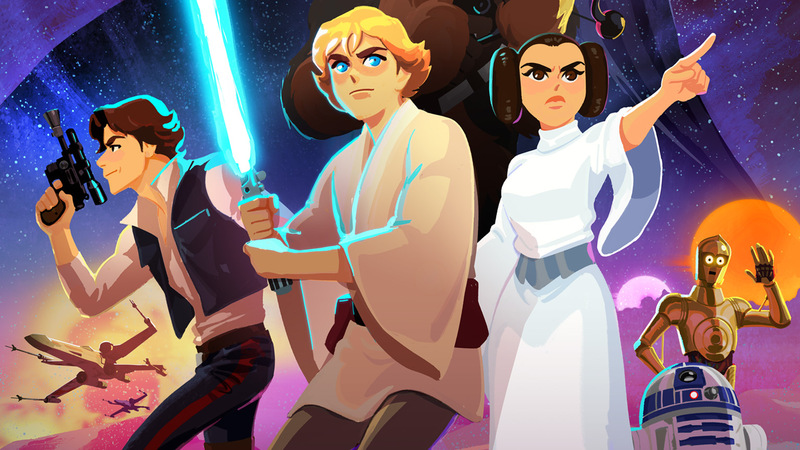 Galaxy of Adventures isn’t Lucasfilm’s first attempt at getting young kids into Star Wars. Forces of Destiny was the previous show on YouTube which also had a toyline. However, FoD’s target demographic was mostly little girls and Galaxy of Adventures has a much broader target demographic, little boys and girls. So let’s see how Galaxy of Adventures performs on YouTube! Please click the graphic for the large version! I color coded each episode to show you who the main character/hero is. The grey bar is the trailer. 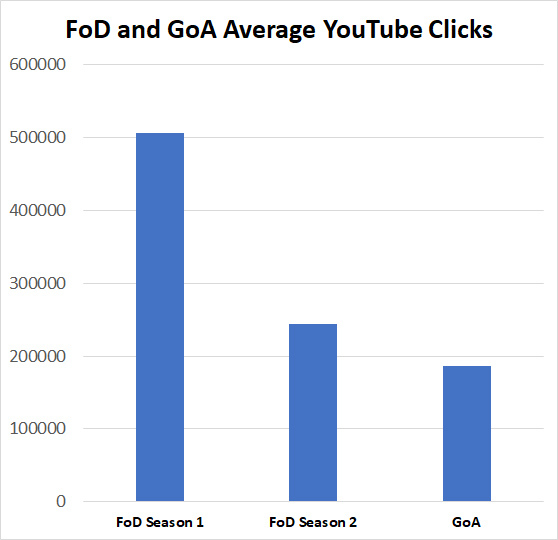 The orange line is the number of average clicks for all individual episodes, but without the trailer. Luke is light blue (like his first lightsaber), Darth Vader is red. 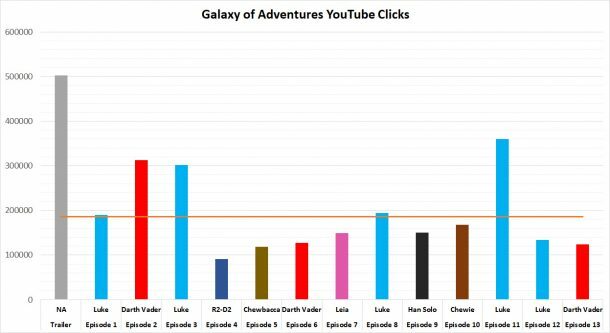 the actual Galaxy of Adventures episodes receive, on average, only 37% of the views the trailer to the show got. In other words, the show lost 63% of its potential viewership after the trailer. It obviously failed to convince more people to tune in. As you can see there has been a steady decline in viewership on YouTube for the animated shorts. Now, Forces of Destiny was hosted on the Disney YouTube channel and even shown on TV (after the episodes aired on YouTube), whereas Galaxy of Adventures is on the brand new Star Wars Kids channel, which may be a factor here. Despite all that you can see that Lucasfilm needs to better advertise the show. Either that or interest in the Galaxy of Adeventures shorts is simply not that high. Any kid would probably need a parent to even find the shorts. But to find the shorts you need to know about them. So even though Galaxy of Adventures has a broader target demographic (all kids) compared to Forces of Destiny which primarily targeted girls, its performance can only be described as lackluster. The Star Wars Kids channel also posts other Star Wars related videos, some fun trivia mostly. But these videos receive even fewer clicks than the Galaxy of Adventures episodes. Maybe it was not the best idea to launch an all new Star Wars channel just for kids and Galaxy of Adventures should have been either on the Disney YouTube Channel or regular Star Wars channel for the shorts to get more exposure? The question now is if a toyline based on a YouTube show many people don’t watch and probably don’t even know about can be a success. The toyline for Forces of Destiny was a failure at retail – and the show had more clicks. Maybe this is one reason why Hasbro decided to repack old figures, instead of investing money in all new sculpts for animated characters based on how they actually appear on the show. The latter would have made more sense perhaps. It remains to be seen if the Galaxy of Adventures show and toyline will meet a similar fate as Forces of Destiny. It’s unquestionable that Star Wars needs kids to keep the franchise alive. But maybe Lucasfilm hasn’t found the right approach yet. Of course, it could always be that the original Star Wars movies don’t appeal to young kids as much anymore as they used to, now that kids have a ton of entertainment to choose from, both in animated and live action format. And of course it takes time to get a new YouTube channel rolling, so maybe the show needs more time. So far, the videos on the channel don’t find a wider audience and the channel has less than 62,000 subscribers. Which means most people who watch the Galaxy of Adventures shorts don’t bother to subscribe and will not be notified when a new video is released. And as always, the ultimate question is: how many actual kids watch the shorts and how many adults check out the videos for themselves? Only Lucasfilm knows that. What do you think? Do you believe Galaxy of Adventures can be a success? Do you think the toyline can be a success? And what do you think Lucasfilm should do to get kids interested in Star Wars? 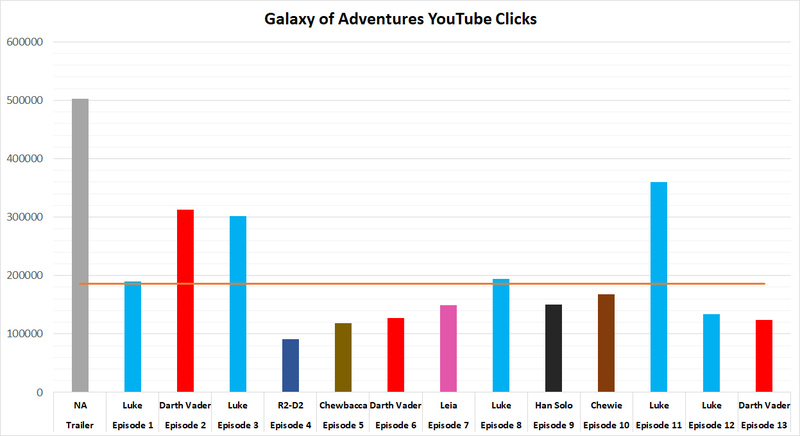 Is Galaxy of Adventures the right approach and simply lacks better marketing? Previous Article: Riddle Of The Day!